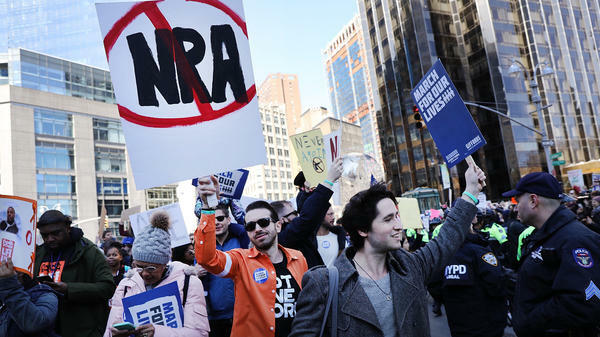 Thousands of people participate in the March for Our Lives protest in New York City in March 2018. For the National Rifle Association, the year since the Parkland shooting has led to a changing — and less favorable — political landscape. Democrats control the House of Representatives, public opinion polling shows a majority of Americans support expanded background checks, and the NRA's political spending is down. And for the first time ever, a growing and better-funded movement now exists to counter the gun rights group. Fred Guttenberg is one of the people now part of that movement. After his daughter's death in Parkland, Fla., one year ago, he sat in his house grieving. "To me, I thought the first thing I need to do is to remove the grip of the gun lobby. And I walked around my house, kind of like in a daze, saying... we're going to go after their money," he told NPR. Parkland motivated people like Guttenberg to get active in politics, joining a growing campaign led by Everytown for Gun Safety — an adversary to the NRA founded by former New York City Mayor Michael Bloomberg. "Parkland was certainly something that seemed to be the straw that broke the camel's back for so many Americans on this issue, but it is also so important to remember the daily gun violence that goes on in this country that gets people involved: suicides, homicides," said Shannon Watts, the founder of Moms Demand Action for Gun Sense In America, a part of Everytown for Gun Safety. This is the first sustained, well-funded opposition that the NRA has ever faced, and the gun rights group acknowledges this new dynamic. "What has changed is that for the first time the gun control groups are well-funded and have ... efforts nationwide," said Jennifer Baker, a spokesperson for the NRA's lobbying arm. "They have an infinite amount of resources, as they're funded by billionaire Michael Bloomberg ... who is decidedly anti-gun. And so he has allowed these organizations to have a presence in the state capitals on lobbying and to really put forth the effort we've never seen." 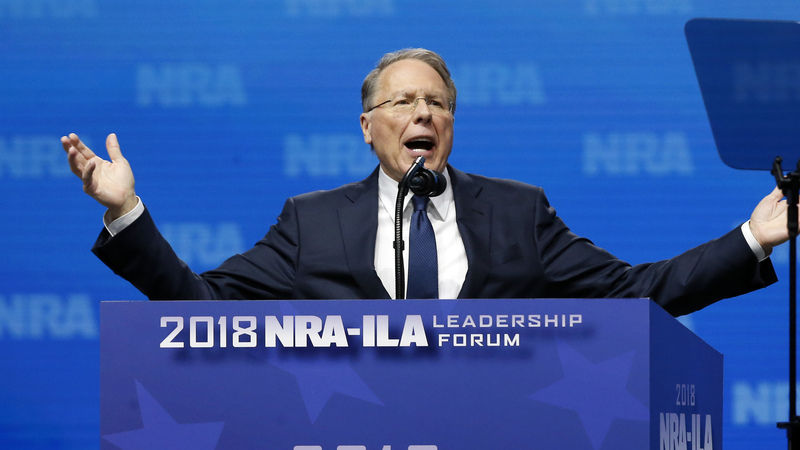 Wayne LaPierre, executive vice president of the National Rifle Association, is leading the gun rights group as it maneuvers a power shift in Congress. For decades, the National Rifle Association has been a driving political force — its large, grassroots membership makes it a formidable organization. In an interview with NPR, its spokesperson put its membership between 5 million and 6 million — its highest tally ever. "We have more dues-paying members than any other grassroots organization in the world," Baker boasted. But last week, the House Judiciary Committee held the first hearing on gun violence in eight years, a reflection of the new Democratic House majority. And Wednesday, that same committee marked up legislation expanding background checks for firearms sales, something polls suggest most Americans support. House Democratic leaders pledge a full House vote soon. That legislation's consideration alone indicates a changing national conversation about gun issues, the bill's supporters argue. "It was considered the third rail of American politics," said John Feinblatt, the president of Everytown for Gun Safety. "That was true for Democrats, it was true for Republicans ... political prognosticators said, it doesn't matter what you feel in your heart, it's just not worth touching. No more." Feinblatt also points out that the NRA spent less money in the 2018 midterms than in previous midterms. "The NRA staged a disappearing act. They were really nowhere to be seen compared to previous years," he told NPR. Meanwhile, the NRA is mired in an investigation by Democratic Sen. Ron Wyden, the top Democrat on the Senate Finance Committee, into whether it was involved in Russian efforts to influence American politics in 2016. William Brewer, counsel for the NRA, said that the gun rights group "believes that no foreign money made its way into the organization for use in the 2016 presidential election." The NRA counters that all of these supposed changes in the political environment are just hype: that the polls on background check proposals overstate support for those measures; and that its lower fundraising is a reflection of how its supporters feel less threatened with Donald Trump as president. The NRA also doesn't believe that new gun restrictions will go anywhere because of allies in the Republican-controlled Senate. And it also points to the Supreme Court, where it believes it has a majority on its side on gun rights issues. "Practically speaking, the landscape has not changed for the prospect of enacting federal gun control. ... In the Senate they don't have the 60 votes that they need, and there is a pro-Second Amendment president in the White House," Baker said. "But what has changed ... is that we now have a majority of Supreme Court justices who are originalists." And Richard Feldman, a former NRA lobbyist, agrees — and says that not only will gun legislation not become law, but that the push from Democrats will also energize NRA supporters. "That's what gets them activated, that's what gets them motivated, that's what gets them to send much higher contributions to the very groups that are dedicated to protect that issue," Feldman said. The NRA's adversaries are determined not to let it gain a political advantage. "They've counted the NRA down and out before. They're certainly not always going to be where they are right now, but it's our job to keep them in a somewhat weakened position so that we can continue to fight for gun safety," Watts said. One year after the Parkland shooting, the political realities are changing. But with millions of loyal and active supporters, the National Rifle Association remains a force to be reckoned with.